Make a pattern in the class that fits you. It may look like a dress, but that is just the way it is accessorized with the Laces as a belt and necklace. It can be worn many ways. Many of you have asked…well here it is. Just like my nuno felting a scarf class, but better! You will learn to felt alpaca on fine hand dyed silk chiffon fabric to create an amazingly fun, forest fairy, rock star worthy, star of the event addition to your wardrobe. We start with hand dyed silk chiffon, adding thin strips of alpaca fiber and other bits of fun texture, like bamboo, silk hankie, mohair curls, Angelina…the list of options goes on… in fun patterns and then wet felt them to perfection. Upon registering for the class, we will ask you what color you would like your silk dyed and have that ready for you at class time. The class includes a ‘starter kit’ of bead embellishments and while we will not be beading the vest in class, a demonstration of beading will be done. We have had some lovely vests made in the class. No two are a like. Class Times: 10:00 am – 5:00 pm (November – March classes begin at 9:00 am and go until 4:00 pm). Class Fee: $150 includes all materials and a Farm to table style lunch. A $25 deposit is required to register. If for any reason I have to cancel the class, you may use the deposit on another class, or we will reimburse you the deposit. 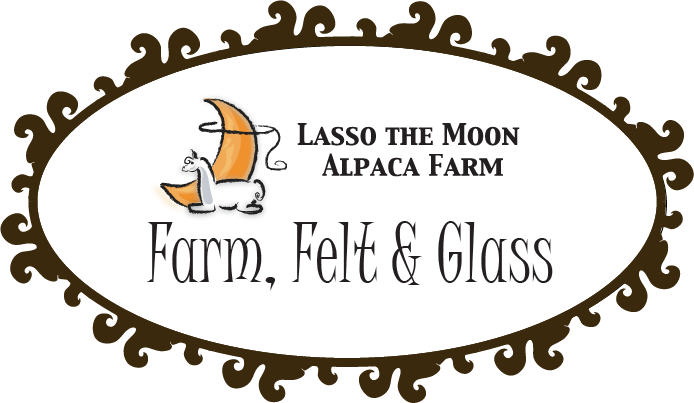 Holly is the owner of Lasso the Moon Alpaca Farm, Lardworks Studio Inc and Laces of Lore Fiber Art. Holly has been teaching fiber art on the farm for over 15 years.